Composting reduces the amount of organic waste going into landfill. By composting your food scraps and green waste, you are converting it into a useful by product that’s ideal for a garden fertiliser. It's a win-win! 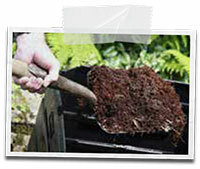 There are a range of steps to successful DIY Composting. Learn how with our easy 7 step guide in our DIY Composting Factsheet available below. DIY Composting factsheet (PDF 4MB). Did you know that worm tubes are ideal for the natural disposal of organic waste including fruit and veg scraps, egg shells, shredded paper and more. Discover how easy it is to make your own worm tubes in our DIY Worm Tube Fact sheet below. DIY Worm Tube factsheet (PDF 4MB).